Blog/ Get Reconnected with Nature. Build a Fort and let the Imagination and Cooperation Begin! Do you remember what it felt like to play outside when you were a child? I get sentimental when I remember making mud pies and cactus berry “jelly” under the shade of my parents’ live oak trees south of San Antonio. Many of us have wonderful childhood memories of our time outdoors, but what will our kids remember about their childhood? We have allowed our children to become disconnected with nature, spending more time indoors exploring the digital world. Meanwhile, obesity rates in the United States have tripled since the 1970’s, now affecting 1 in 5 of our nation’s youth, and teenage depression is on the rise. While researchers are working to uncover the effects of screen time on kids and their developing brains, the adverse health consequences of childhood obesity are well-documented. Inactive, sedentary behavior is one significant contributing factor. Why is it time to get outdoors, get active, and reconnect our kids and families with nature? Because the link between nature and health, and our dependence on the natural world are recognized. Groups like the Center for Health & Nature are working to advance the mission of improving health and healing through nature with evidence-based programs, and academic initiatives have been founded to promote the importance of the natural environment in the daily experience of all children. Cities are catching on, too. Ultimately, studies suggest that children who play and learn in nature are healthier, happier and smarter. For example, did you know that time spent in and around natural environments supports many aspects of children’s health, including their ability to connect and cooperate with others? 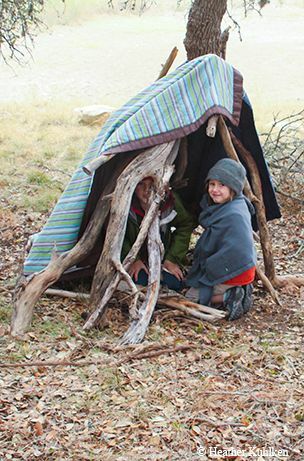 Building a fort outdoors (your yard counts!) is one way kids can get out and play, and develop their sense of imagination and cooperation while they build a special place they can call their own. They can use sticks or branches to make a lean-to, string a tarp between trees or even build something with lumber and nails. Let the imagination and cooperation begin! Get reconnected with nature near you. Find other places to play, explore and connect at NatureRocksTexas.org.